If you're overweight and need to drop a few pounds, it sounds easy. But the older you get, the harder it is. I talk about this in my book, Bursting With Energy. It has to do with your metabolism. When you lose weight, your metabolism drops. Now a new study is showing us just how much of an effect it is and how long it lasts. In this study, the researchers looked at 22 overweight men and 69 overweight women. The ages were from 31 to 49 years old. They put them on a weight reduction diet for eight weeks. And then for the next 44 weeks, they made sure that all of them maintained their weight loss. What happened to their metabolisms? On average, every subject's metabolism decreased 4%. The medical term for this lowering of metabolism after weight loss is "adaptive thermogenesis." And here's the thing. That decrease stayed in place even after a year of maintaining the new weight. Now a 4% drop in metabolism might not sound like a lot to you. But let me put it this way. 4.54 x weight (pounds) + 15.8 x height (inches) - 4.92 x age. Using this formula the calorie needs for our young woman come out to about 1,393 calories per day. And 4% of that is 57 calories. So the decrease in her metabolism that would come from a weight reduction diet would be 57 calories a day. After three months (90 days), that would come to 90 x 57 = 5,130 extra calories. This amounts to 1½ pounds of fat. Accordingly, our woman would be gaining about 1½ pounds of fat every three months due to her adaptive thermogenesis. The end result? Eventually she will regain all the weight she lost. But what if somehow her metabolism corrected itself over time? That's a nice idea. But that's not what the researchers in this study found. After one full year, the drop in metabolic rate didn't correct at all. So there's not much hope for our gal unless she either stays on a diet forever or gets her metabolism measured and corrected. But there is one other answer. You have heard me talk about Bio-Energy Testing many times before. I feature it in all my books, and I have several talks on it that you can see by going to the video page of my clinic web site (www.antiagingmedicine.com). Bio-Energy Testing can tell you just how low your metabolism is because it directly measures it. 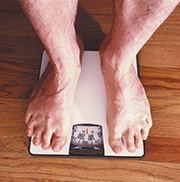 Once your doctor knows how low your metabolism is, he or she can use information to correct the problem. And the problem is almost always low thyroid function and low DHEA levels. Once your doctor gives you the right amount of thyroid hormone and DHEA to re-establish a healthy metabolism, you won't regain the weight. You can find doctors who offer Bio-Energy Testing in the Bio-Energy Testing Centers list at www.bioenergytesting.com. Not only will it help you take the weight off and keep it off, it will also rev up your energy levels. You'll feel great. Camps SG, Verhoef SP, Westerterp KR. Weight loss, weight maintenance, and adaptive thermogenesis. Am J Clin Nutr. 2013 May;97(5):990-4.